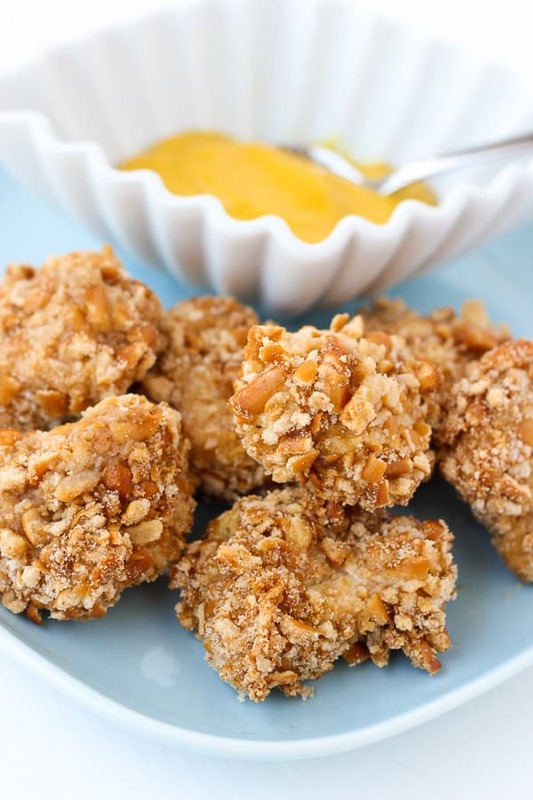 Gluten-Free Pretzel Crusted Chicken Bites! Quick, EASY and so delicious you’d never guess they’re gluten-free! I made this pretzel chicken on a whim earlier this week when I didn’t feel like going to the grocery store. I had frozen chicken, gluten-free pretzels leftover from a road trip, the ingredients for rice pilaf, and some frozen vegetables. It turned out to be a fabulous dinner! This pretzel chicken was so delicious, my husband requested it join our regular meal rotation. My 3-year-old also loved it! I haven’t been impressed with gluten-free bread crumbs and have just avoided breaded chicken up to this point in eating gluten-free. Gluten-free pretzels aren’t something I buy often, but they sure are delicious when I do! I think they taste even better than regular pretzels. For the chicken, I first dredge it in some seasoned gluten-free flour. Then it is dipped in beaten egg (substitute milk of your choice for egg-free) followed by the crushed pretzels. 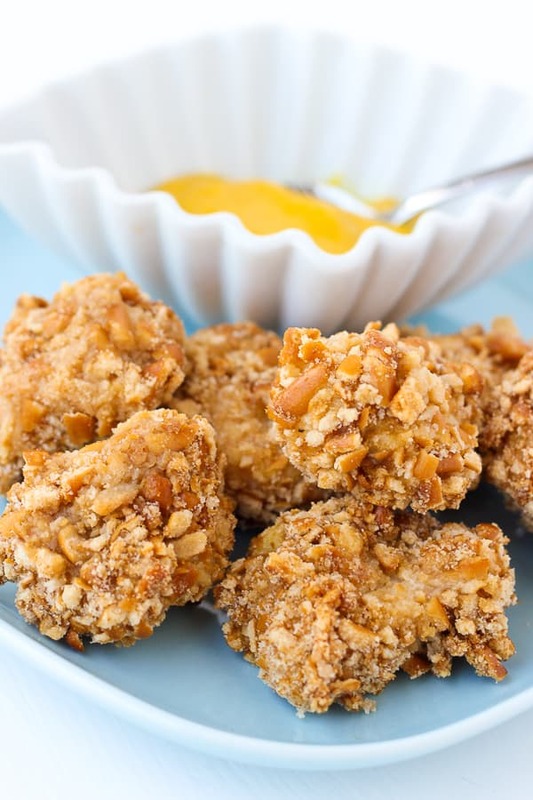 This makes for an extra crunchy and flavorful coating. Just bake the chicken for 8 minutes on each side and serve with your favorite dipping sauce. 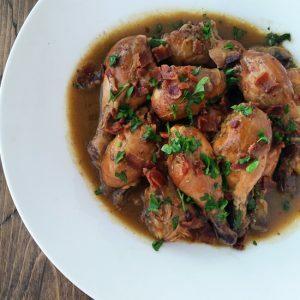 These make for an easy and delicious weeknight dinner the whole family will love! To make this egg-free, you can substitute butter or an unsweetened dairy-free milk for the eggs. Preheat the oven to 400F. Line a baking sheet with a silicone baking mat or parchment paper. Cut the chicken breast into bite-sized pieces. Place the crushed pretzels (I crush mine inside a ziploc bag) in a swallow dish. 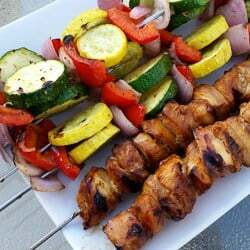 In another dish, mix together the flour, salt, pepper, onion powder, ground mustard, and garlic powder. Whisk the eggs until smooth in a third bowl. Dredge the chicken by first placing it in the flour. Shake to remove the excess, then place and coat in the egg. Last, roll the chicken in the crushed pretzels and place on the baking sheet. I usually dredge 2-3 pieces at a time and have one hand be the wet hand and the other be the dry hand to keep things from getting too messy. Once all the chicken is coated, spray the chicken lightly with cooking oil. This will help the surface crisp and brown. You can just brush it with coconut oil if you prefer. Bake the chicken for 8 minutes then use tongs to flip with it to the other side. Bake for another 8-10 minutes until cooked through and crispy. Serve with dipping sauce if desired. Enjoy! Oh my GOD this pretzel crusted chicken looks incredible – wish I had a bowl of it to devour right now! It’s hard to believe that the chicken is baked they look so crisp, crunchy and golden. Thanks for the great recipe! 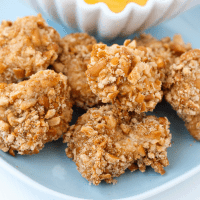 We think of these pretzel bites like they’re fancy chicken nuggets. We LOVE them!